The Ontario Government has created the Healthy Kids Community Challenge to motivate communities, to engage youth to become more active and eat healthier. The challenge is being delivered locally by 45 different regions/municipalities throughout Ontario. 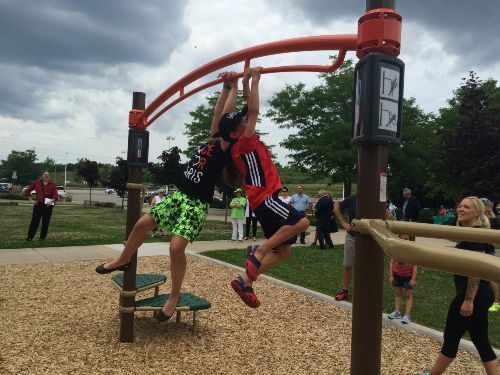 Niagara Falls, along with the other 11 Niagara Region municipalities are participating in partnership through Healthy Kids Community Challenge Niagara. About every nine months, the Ministry of Health and Long-Term Care will launch a new theme related to physical activity, learning or healthy eating. The Challenge enables municipalities to tailor programming for their community to encourage youth to participate. This first theme, Run. Jump. Play. Every day. started on May 1 in Niagara Falls. This theme encouraged physical activity through a mix of active play, sport, active transportation and structured activities. The City of Niagara Falls, along with its partners created the Niagara Falls Activity Passport for theme 1 in an attempt to reach all Niagara Falls students within grades 1 through 6 to get active. A youth fitness station was also built at the MacBain Community Centre. Theme two, Water Does Wonders targets water consumption with youth. The theme concentrates on media campaigns to make youth aware of the benefits of water and the negative impact that sugar drinks can have. Municipalities were also allotted budget to purchase and install water filling stations in public areas concentrated with youth. Theme, Choose Veggies and Fruits targeted eating habits by encouraging a healthy intake of vegetables and fruits. 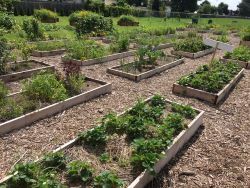 The City of Niagara Falls in partnership with DSBN, Project SHARE and Links for Greener Learning coordinated a group project of constructing a new outdoor learning centre equipped with 40 accessible community garden beds constructed on May 26, 2017 at Westlane Secondary School in Niagara Falls. The project was made possible through monies from the Healthy Kids Community Challenge Niagara, TD Friends of the Environment and DSBN. Students and volunteers also planting trees and thousands of wildflowers. Partners were able to deliver programming to youth and adults on how to grow fruits and vegetables, healthy cooking seminars and environmental study. Portions of the produce grown at the garden will be donated to Project SHARE and sold at the Niagara Falls Farmer’s Market to help offset future costs associated with the new community gardens. In total, the project cost just over $50,000 to complete. Included in the budget was the purchase of a portable kitchen that will be used on-site and then tour around to different locations to conduct healthy eating cooking classes. Theme 4, Power Off and Play! will be launched in 2018 with the Healthy Kids Community Challenge Niagara network working to encourage children and families to build a balanced day that is not filled with screen time. ‘Screen time’ is the time spent using a screen-based device, such as a smartphone, tablet, computer or television. Not all screen time is unhealthy. Screens can offer an important way to learn and communicate in school and at work. They can also be used in an active way – like playing tennis, soccer, baseball or other sports games on a device. Screens can also be used for recreational purposes such as watching movies and playing games. Kids may be sitting, reclining or lying down the whole time they are using their device. This is called sedentary screen time and many children are getting too much of it. This could interfere with and take time away from healthy activities in their day. It could even affect their health. The focus of Theme 4 - Power Off and Play! is on minimizing children’s recreational and sedentary screen time. This theme helps children and families build a balanced day.